✓ In GST regime it is very easy for the market to sell their product because there is no bias and buyer can purchase from any registered vendor. ✓ Gst means goods and simple tax so it means input will be available for all purchases and expense. So we are there to help our clients in attaining that. ✓ The one who legally follow’s the market rules and regulation are successful now a day and we are there to help our clients in that. So the opportunity is at your door to comply with GST rules with us. Nowadays in the digital era, all the digital are becoming digital and in today’s times the way of business has changed and people have started the online business instead of offline – With Amazon, Flipkart, Ebay, Snapdeal etc. Through these online sites, the business has become national level rather than just a local area, So it is mandatory to register a GST, because if you want to do business from one state to another State, then GST registration is very important, without GST you will not be able to do business outside your state! 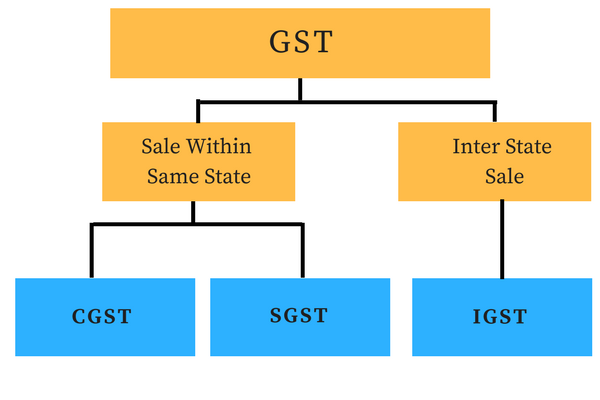 What are SGST CGST and IGST? SGST, CGST, and IGST are part of Goods and Service Tax. CGST and SGST are charged when movement of goods and services in the same state. Examples. If a person of Delhi sells the goods to the person of Delhi, and the rate of GST on that item is 18% then 9% CGST and 9% will be SGST. And if the goods are sold to a person outside the state then IGST will be at the rate of 18%. • The person whose annual turnover is 20 lakh or more. GST registration is mandatory for him/her. If that person does not register the GST, then he/she will be prosecuted. • The person and the business who are doing business with the online marketplace like Amazon, Flipkart, ebay Snapdeal e.t.c. GST Registration is necessary for him/her. • The person or business whose selling its goods and services from one state to another state then GST registration necessary. No matter his/her annual turnover is more than 20 lakh or not. • If you are required to pay tax under reverse charge. • Input Service Distributor and etc. 3. ID Proof & Address Proof. 4. Passbook first-page copy or Cancelled Cheque. 5. Electricity Bill or Rent agreement (If you are on rent). We are offering GST Registration in Delhi just 499/- Rs only. We will not charge any extra money to our clients. We will start GST Registration process on the same day when you will provide your complete documents. You can get GST Certificate in 2 to 7 working days, It’s depending on government preparing time. Usually, It takes 3 working days to get GST Certificate.